— Leonard Lauder, Chairman Emeritus, The Estée Lauder Companies Inc.
A few years ago Holly Holden's daughter, Alexandra, posed the following question to her mother: "How do I create my first 'Big Girl' house?" Alexandra wanted to create a house with elegance, sophistication and refinement. Holly was well-suited to answer her daughter's questions since, at that point in time, she had been designing stately rooms for more than twenty years. As Holly began to write down a few notes to educate and guide her daughter, The Pretty and Proper Living Room was born. Over the next two and a half years, Holly worked constantly to distill her considerable experience down to a set of rules that was easy to follow and easy to understand. The Pretty and Proper Living Room is meant to be both a guide and a reference. The book introduces newcomers to the prevalent themes of formal decorating. Everyone can appreciate the regal charm of a tailored room, but there has never been a gentle manual about how to create one... until now. The book is as entertaining as it is informative. Personal anecdotes of Holly's experiences as a designer, a mother, and a hostess are interwoven with detailed descriptions of the must have items for a formal living room. The book is replete with practical advice about how to acquire, display, and maintain these items. Each chapter ends with a set of Forbidden Faux Pas that explain common design mistakes and points of etiquette. In The Pretty and Proper Living Room, Holly speaks of formal design as a "secret code;" an oral tradition that is passed down from generation to generation. The secret code spells out a style that is timeless and tailored. 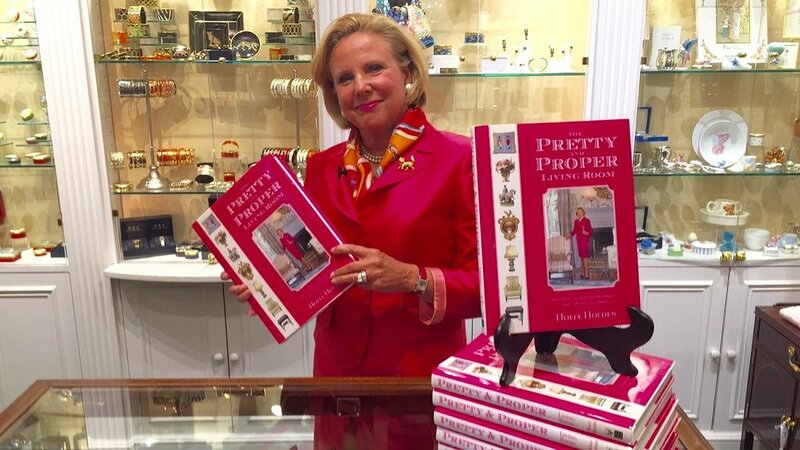 Readers of The Pretty and Proper Living Room will be able to apply the knowledge in the book to create their own stately interiors with the goal of decorating once... for a lifetime.